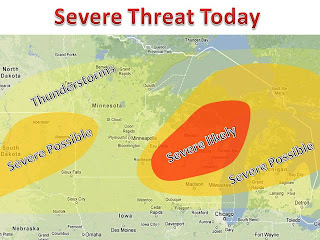 In a drought stricken region of the midwest a strong threat is prevalent for strong thunderstorms with very heavy rain. Any storms that do develop will create locally heavy rain due to the very moist air mass they are in. Damaging winds, hail, and isolated tornadoes are also likely. The are in red will likely see a tornado or severe thunderstorm watch later this afternoon. Be prepared and monitor local watched and warnings.